Oysters were in plentiful supply in the 19th century and were so inexpensive that the working classes could afford to eat them every day. Over 700 million oysters were eaten in London alone every year. Bought from street sellers and wrapped in newspaper, they were eaten covered in vinegar or salt, in much the same way as a modern portion of chips. 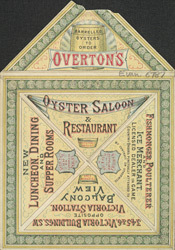 There were also speciality oyster bars and restaurants like the one featured on this leaflet.